Now 30% OFF in the Crochet Spot Store, the First-Timer Doily is a great pattern for beginners who want to try doilies for the first time. Yet, it is still and interesting enough pattern for experienced doily makers. The pattern uses a slightly thicker thread to make it easier for first-timers to hold and work with. 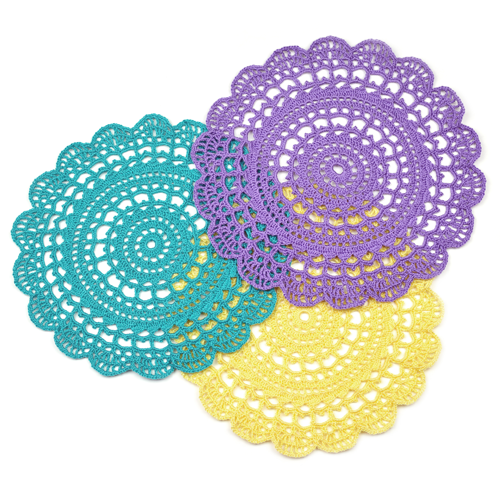 Crochet your own set of doilies in a variety of colors! Pattern is already marked down. There is no need for coupon codes. Log in, then add the pattern to your cart and check out. All purchases can be downloaded directly from your account once completed. Offer ends March 15, 2018. This entry was posted on Friday, March 9th, 2018 at 11:28 AM by Rachel Choi	and is filed under News. You can follow any responses to this entry through the RSS 2.0 feed. You can skip to the end and leave a response. Pinging is currently not allowed. What a lovely pattern! I don’t know what I would do with a doily, but my gosh is this beautiful or what? Doilies are for looking beautiful and displaying skillful stitchwork. You could lay one under any other beautiful object on a table or frame it for display. Some people think they’re old-fashioned but personally, I much prefer old-fashioned and classic to trendy and faddish. I have this pattern, but haven’t made it yet; this is a reminder that I need to get out my thread!